Garmin released the 65W dash cam in 2017. 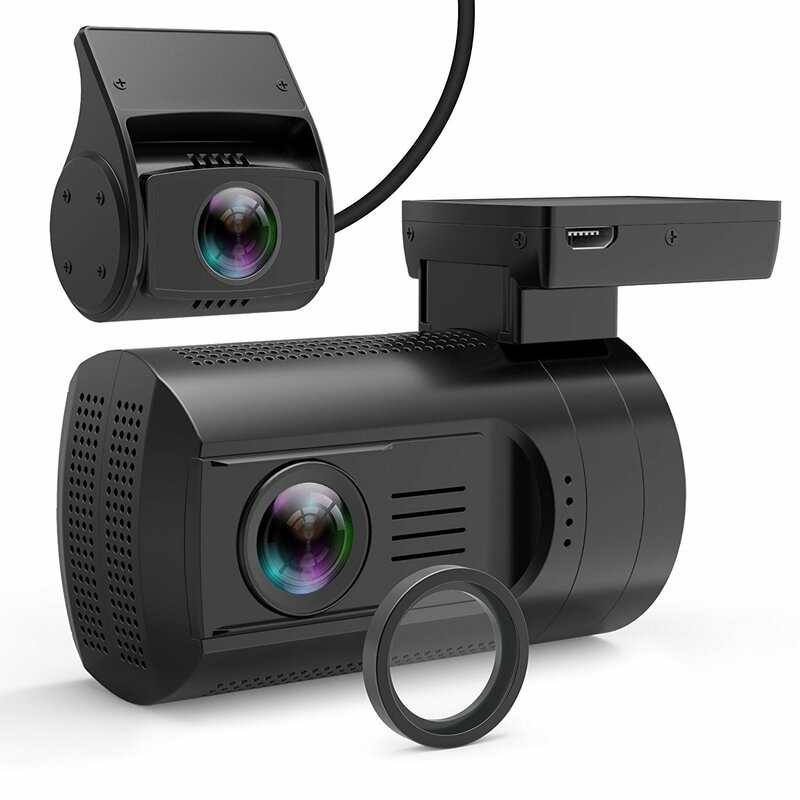 It features an extra-wide viewing angle of 180 degrees, wider than any other dash cam that we know of. Let’s start with the good things about this camera: First of all, you will immediately notice that it’s small. Really small. It is also all black, without the noticeable red or orange ring around the lens that some older Garmin models have. Big improvement! It comes with a convenient 2″ (diagonal) screen on the back, making it a breeze to set up and configure. The manual is very well written. It’s short and to the point. You probably won’t even need it, since the device is really user friendly. It’s simple to install, even for newbies. The mount is practical. Just stick the magnet mount to the wind shield, and the camera attaches to it magnetically. It’s easy to remove and re-affix the camera. You unplug it and take it off, takes about 2 seconds. A suction cup mount is also available for some extra money. The camera supports Wi-Fi, and free apps are available for Android and iOS phones. You can download pictures and video clips to your phone (videos take a while though). A basic parking mode is also supported, however you need to get a hard-wiring kit for this to work (not included). The Garmin 65W will warn you of red light and speed cameras (this is not available in all regions though). Garmin’s customer support is excellent. As a major company with a huge brand recognition, they definitely go the extra mile to ensure that their customers are happy with their products. The 65W uses an internal Lithium ion battery, and can thus be prone to overheating. A recent firmware update has reduced overheating issues quite a bit, however if you plan to use your dash cam in a hot environment, it’s better to get one with a capacitor. The super-wide field of view allows the camera to see more of the road, but it also leads to reduced sharpness and less depth-of-field. The left-hand and right-hand edges of the video are noticeably distorted. Thus, the 65W’s video quality isn’t all that great for a camera of this price. We found the Garmin 65W’s video quality to be good at day time, but only average during the night. You can certainly see what’s going on around you, but lack of sharpness often makes it hard to discern other cars’ registration numbers. Driver assistance feature like Lane Departure Warning are prone to false alarms. Not terribly so, but we don’t find these features all that useful anyway. Your mileage may vary. The Garmin 65W comes with a feature called “Travelapse” that allows you to produce time-lapse video of your ride. It will compress several hours of driving to just a few minutes of video. Garmin calls this an easy and fun way to share your travel videos, but we found that it just looks kind of weird. It’s a nice gimmick, but nothing we would use much. Some people do like to upload their road videos to Youtube though. The camera can either be controlled with the four buttons on the right-hand side, or it you can control it using voice commands. You can tell it to take a picture, save video, toggle audio recording, or start and stop Travelapse. However, if you are conversing with someone in the car, the camera will sometimes think you’re talking to it and come alive with a beep. This can be mildly annoying but it’s not a biggie. If it really bothers you, you can always turn off voice control in the settings. Ease of use, excellent customer support, and generally a well thought-out design are huge plusses for the Garmin 65W. It’s stealthy and discreet, and Wi-Fi and GPS are useful traits to have. The 180° field-of-view is unsurpassed, but results in significant distortion near the edges of the screen. As a result, we found the camera’s overall video quality to be sub-par, especially for its price. Also, be careful when using it in hotter climates. That being said though, user satisfaction is pretty good, and more than 70% of buyers gave the 65W a positive review (4 or 5 stars). Day time video quality is good. The field of view is huge indeed, and you can see most of the details even though the video is distorted near the edges. License plates are readable by pausing the video. Night video quality is only average. It’s almost impossible to read other cars license plates, even though the road is relatively brightly lit due to street lanterns and snow. The only moment in the video where you can read a license plates is near the end, when stopping at a traffic light.